పైపర్ (Piper) పుష్పించే మొక్కలలో పైపరేసి కుటుంబానికి చెందిన ప్రజాతి. The largest number of Piper species are found in the Americas (about 700 species), with about 300 species from Southern Asia. There are smaller groups of species from the South Pacific (about 40 species) and Africa (about 15 species). The American, Asian, and South Pacific groups each appear to be monophyletic; the affinity of the African species is unclear. Some species are sometimes segregated into the genera Pothomorphe, Macropiper, Ottonia, Arctottonia, Sarcorhachis, Trianaeopiper, and Zippelia, but other sources keep them in Piper. 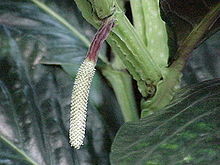 Piper caninum, SE Asia to Australia, Common pepper, Native pepper in Australia. Piper cenocladum – "ant piper"
Piper aggregatum and P. fasciculatum are actually Lacistema aggregatum, an entirely unrelated angiosperm from the family Lacistemataceae. ఈ పేజీలో చివరి మార్పు 8 జూన్ 2014న 12:42కు జరిగింది.